Urban activists in these cities may not have managed to rally official support for cycling culture - but they have found novel ways of installing their own bike lanes. Urban activists have long been calling for the right of way for those exploring their cities on two wheels, but only a few cities have heeded that call. Guerilla or DIY bike lanes are one way of fighting for the civil right of road-safety across borders. Although this brand of urban activism has existed for years, the past three years have witnessed a heightened activism in cities where the absence of cycling infrastructure to protect cyclists has resulted in fatal accidents. Here are five cities where urban cycling activists have taken it upon themselves to challenge their cities’ municipalities and find novel ways of installing their own bike lanes. Plungers line bike lane in Wichita. Citylab. It was only weeks ago when Todd Ramsey pulled up to an intersection as he was cycling in downtown Wichita in Kansas and saw what he assumed to be traffic barriers with reflective tape lining a bike lane. “Wow, the city did something to kind of make this intersection safer,” he thought, but as Ramsey got closer he found that the barriers were in fact toilet plungers. The plungers – a temporary feature – were installed by anonymous bike safety advocates. The City has since installed plastic delineators to create formal bike lanes. 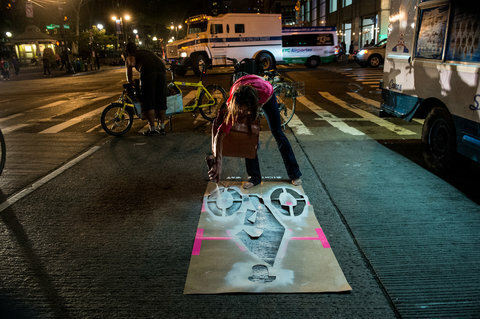 Bicycling activists including Liz Patek painted unsanctioned bike lanes along a stretch of Avenue of the Americas on Saturday evening. Robert Stolarik for The New York Times. Although New York was one of the first cities in the world to have bike lanes – with the first dating back to 1894 – it was not until 1980 that the city began to accommodate cyclists, when then-Mayor Edward Koch installed the city’s first protected bike lanes. In spite of the City’s efforts under Mayor Michael Bloomberg and the appointment of Janette Sadik-Khan as transportation commissioner, the Big Apple’s notorious traffic has left little room for those traversing it on two wheels. But things took a serious turn for cyclists in New York City when a cab driver ran over a cyclist on the sidewalk in August 2013, resulting in the cyclist losing her foot. In response, Right of Way, an activist collective dedicated to upholding rights of pedestrians, cyclists and skaters, painted a bike lane in 6th Avenue from 42nd to 59th street. In 2014 in San Francisco, two cyclists were killed in two separate hit-and-runs. In response, a group of anonymous urban activists who call themselves San Francisco Municipal Transformation Agency lined some guerilla bike lanes using traffic cones as protection along Golden Gate Park. San Franciscans expected the municipality to remove the guerrilla bike lanes, but City authorities did the unexpected and opted to keep the lanes permanently. Guerrilla bike lanes are far from exclusive to the US. Fed up with the municipality’s neglect of their needs, cyclists in Guadalajara, Mexico took matters into their own hands when they painted their own bike lanes on the city’s overcrowded roads. 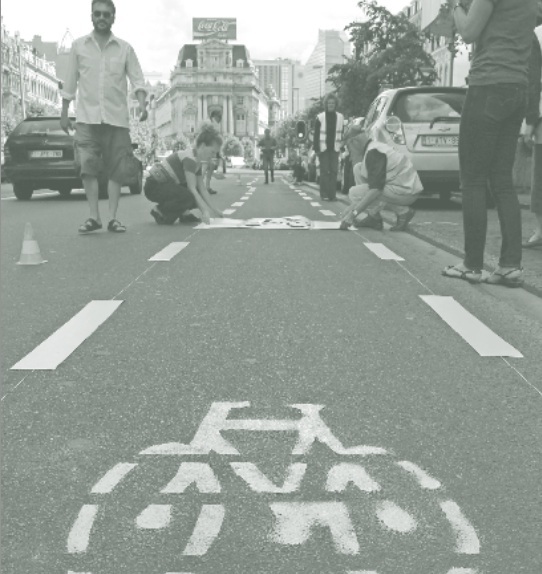 In Europe, Brussels got DIY bike lanes in 2011. There, a cyclist group called “VeloFiets Bruxsel” were also tired of broken promises, and decided to create their own bike lanes on the main street, creating a safer commute for fellow cyclists.